This man, Daniel Cole, left a 20 year old “Danielle Maudsley” brain-dead. No criminal charges were brought against this man, and he faced no punishment. Daniel Cole has escaped criminal charges more than once “protecting the public”. Trooper Daniel Cole was also involved in the shooting of an innocent man tending a graveyard, Trooper Daniel Cole can no longer be trusted to serve & protect the public. The People no longer trust him! 20-year-old Danielle Maudsley may never wake up again. 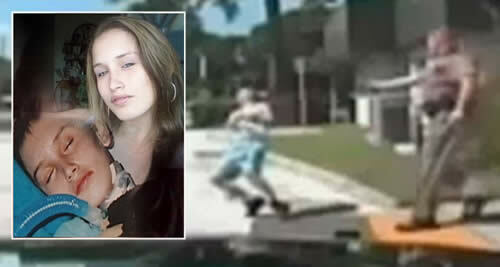 Danielle was left brain dead after she was tasered by police which caused her head to hit the ground. Maudsley was taken to a Florida Highway Patrol Station after being arrested for a suspected hit-and-run in September. While she was handcuffed, she ran out of the door, spun, fell backwards and hit her head on the ground. Bleeding and crying, she tried to get up. She then blacked out and has remained unconscious ever since. Doctors say Danielle will most likely never wake up. Her mother, Cheryl has been critical of the Department of Highway Safety and Motor Vehicles and Florida Department of Law Enforcement stating she was suing FHP. Should Trooper Daniel Cole have a job after shooting two innocent men and tazing an unarmed woman?